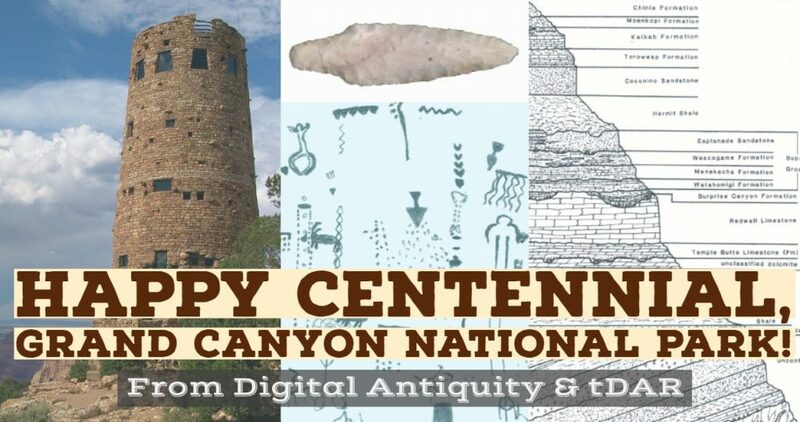 The 84th Annual Society for American Archaeology meeting is just around the corner, and Digital Antiquity staff look forward to participating in a variety of symposiums, forums, and other events throughout the week of April 10-14, 2019 in Albuquerque, New Mexico! Digital Antiquity highlights will include a symposium honoring the illustrious career of Keith Kintigh (4/12), a workshop geared towards helping SAA members utilize tDAR’s digital data curation services (4/13), and many other exciting happenings listed below. Digital Antiquity staff will also be on hand at Exhibit Hall booth #505 throughout the week, so be sure to stop by with any tDAR or digital curation related questions, learn more about the SAA/Center for Digital Antiquity Good Digital Curation Agreement, enroll in our raffles to win some great prizes, or just stop by to say hi! Follow us on Twitter @DigArcRec and Instagram at digitalantiquity for up-to-the-minute tDAR news throughout the conference! The Grand Canyon is an astonishing natural resource that has enchanted humankind for thousands of years. As evidence, this national treasure is filled with ancient and historical archaeological sites, cultural landscapes, and historic structures. 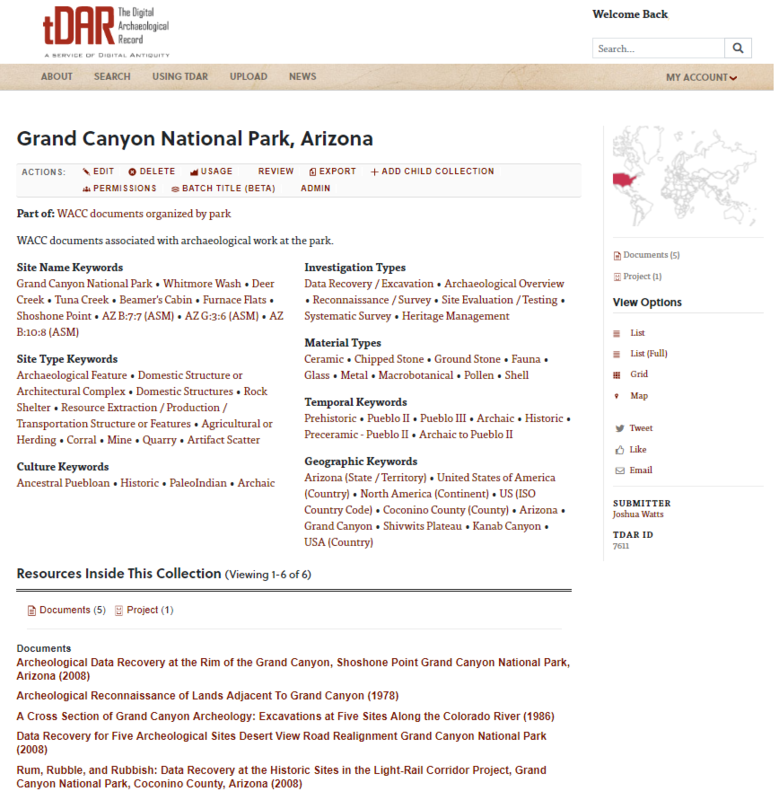 In honor of Grand Canyon National Park’s Centennial, we invite you to dig into the Grand Canyon’s near and distant past by accessing maps, photos, research, and other resources available in tDAR! 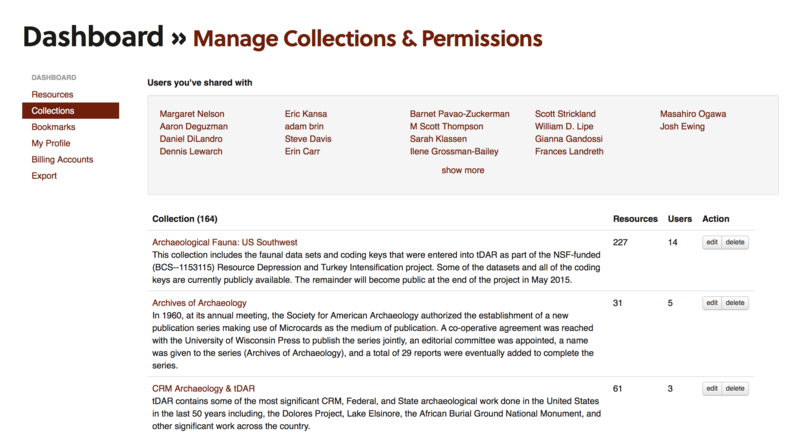 As always, tDAR’s wealth of archaeological resources are free to access and share! Register for free to learn more about the incredible cultural landscape of the Grand Canyon! Digital Antiquity is pleased to announce Quartz, tDAR’s 18th major release. This release focuses on enhancing collections, email, and other smaller enhancements. 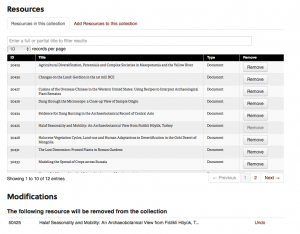 Resources owners now have new and easier ways to manage their collections. We we have made a number of changes to ease the management and creation of collections. 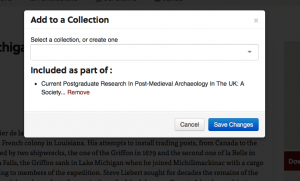 First, from the resource page, you can now click the “add to collection” button and quickly add a resource to a collection from there. Second, the collection edit page now makes it a bit easier to both see everything in a collection and add/remove items from it. 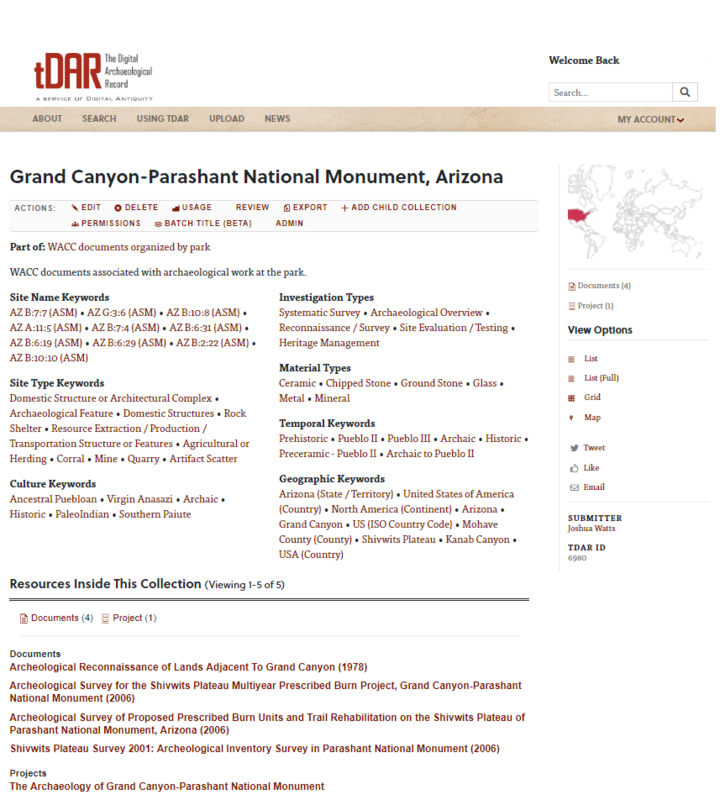 New type of Document: We’ve added a long-requested type of document “Report.” This new document type allows contributors to identify archaeological reports in tDAR and to distinguish them from “books” or “other materials.” If you have contributed materials to tDAR in the past, this feature is now available to you. If you have a large number of reports that should be converted, please contact us. Pretty emails from tDAR: All of the emails from tDAR are now easier to read, and cleaner. A ton of smaller bug fixes and performance enhancements. Digital Antiquity is pleased to announce Prehistoric, tDAR’s 16th major release. This software release showcases: a unified search interface, significant improvements to features related to rights and permission, a redesign of the dashboard, as well as many smaller updates and general improvements. The simple and advanced searches in tDAR continue to search active resources, but now also search collections and data integration. This means that no matter what you’re looking for, you can now search in one place. We’ve also added a separate “limiting” section on the left to allow you to drill down to a specific type (if needed). tDAR has always supported Open Access for materials, but we recognize that not all materials should be publically shared. In this release of tDAR we’ve added a number of features to assist in the management of rights and permissions. We’ve moved the rights and permissions section from the collections and resource edit pages into their own dedicated pages. This allows for faster and easier access to these functions. It also allows us to add a few new features such as timed access and invite a user. You can now grant access to a collection of resources or to an individual resource for a limited period of time. 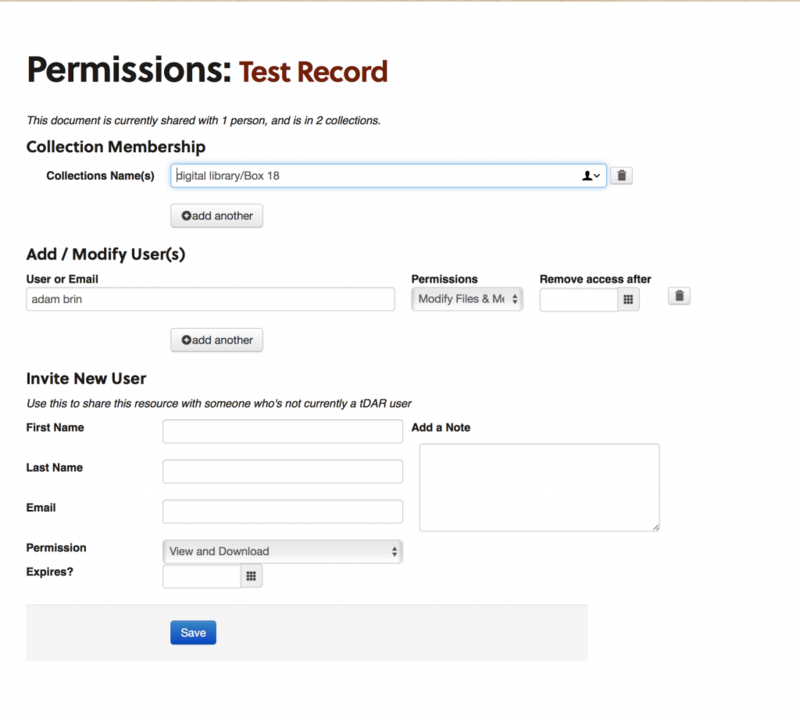 Simply select a person, assign rights, and choose a date after which the permissions will be revoked. tDAR will email both you and the user to let them know when access has expired. Have you ever wanted to share access to a resource or a collection, but the person you wanted to share with wasn’t currently a tDAR user? In Prehistoric you can add unregistered users to the access page. You will be prompted by tDAR to customize an invitation email to the unregistered user, and when the new user registers, he or she will be granted access to the item automatically. We’ve separated out the user dashboard into a series of pages, each dedicated to a specific task: “resources”, “collections”, “bookmarks”, “billing accounts”, “my profile”, and “export.” Each of these pages integrates features from the existing dashboard but provides easier access. As a final note, we would be remiss without recognizing the significant contributions of Jim DeVos to this and all other releases over the previous six years. We wish him the best in his new role with the ASU Libraries. We are also glad to have Brian Castellanos join us and look forward to work with him to make tDAR better. Welcome to Obsidian: The Center for Digital Antiquity’s 15th major release of tDAR. In this overview of Obsidian you will find information detailing both the major and minor improvements made to the tDAR system. 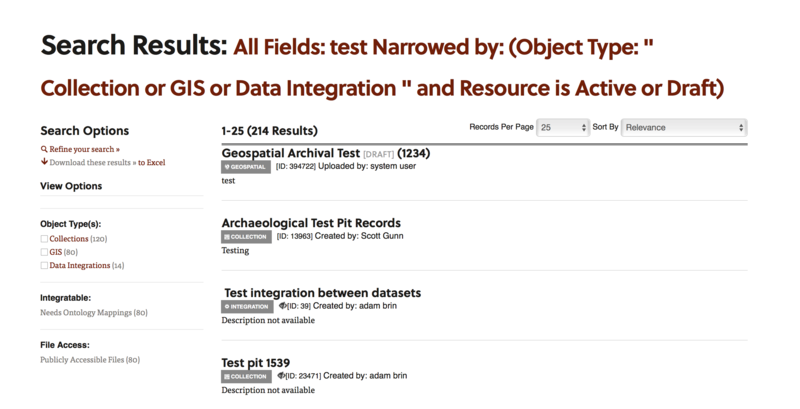 The pertinent modifications of Obsidian include improvements to Collection and Keyword Pages, Maps, Data Integration, and a new export feature. We have enhanced collection pages (example) to include more summary information about the collections’ contents. 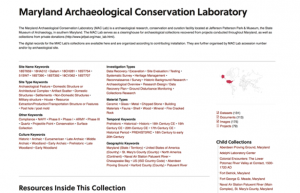 This includes a map showing where the resources in the collection are located geographically (aggregated from the bounding boxes) and clusters of common keywords related to the resources in each collection. Additionally, when viewed in the “map view”, collections now dynamically load all of the items in the collection onto the map. Coding sheets now have an error report displaying values that may be missing from them, but are present in the datasets they’re mapped to. They also include “special” mappings for values that are unknown, or missing. One of the missing features for data tables was a user’s inability to add a description to a dataset; we have corrected this issue. With datasets like the Mimbres collection, we’ve added a new column type “filename” that simplifies the mapping between a row in a dataset and an image file. With tDAR’s coverage being worldwide, one challenge is allowing a user to identify a specific area on the map to either search or draw their bounding box. We’ve added a search box in the top right of most maps to allow users to specify a town, city, state, or country to navigate on the map to the approximate location. We’ve expanded the world map on the homepage to allow users to filter down to specific states within the US. 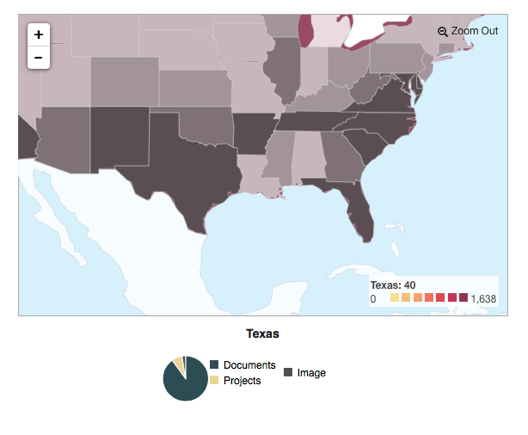 Users can now see how many resources are associated with each US State as well as country. This has also been implemented in an extensible form that will allow us to implement similar maps on collection pages. We’ve removed some of the debugging associated with the initial SOLR implementation as well as improved how we display and manage information in SOLR to significantly impact the search performance (In some cases, up-to 10x faster). Of note here, we were extremely conservative in our initial implementation of SOLR, and this release, along with the next few will start to make more aggressive changes that take advantage of all of SOLR’s features as well as improvements. It’s important for users to feel confident about contributing their data to tDAR. 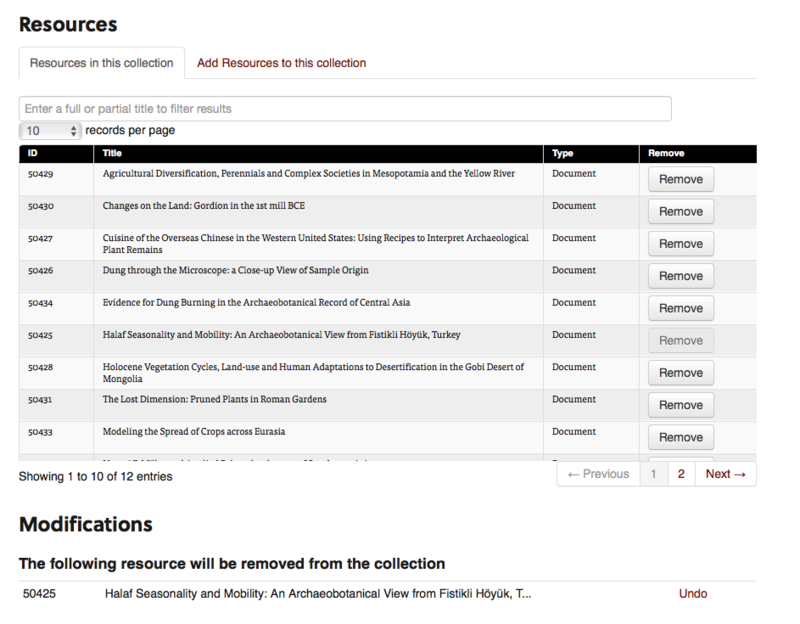 Part of fulfilling our promise of being an archive is allowing users retrieve their materials again. We’ve added the ability to export all of the files associated with a billing account or collection. Users can make a request and the system will create a ZIP file with all of the files they uploaded, any archival versions, and copies of the XML metadata records, providing a description of all records. We’ve added the ability to associate keywords with external vocabularies such as Open Context, Pelagios, and other authorities. 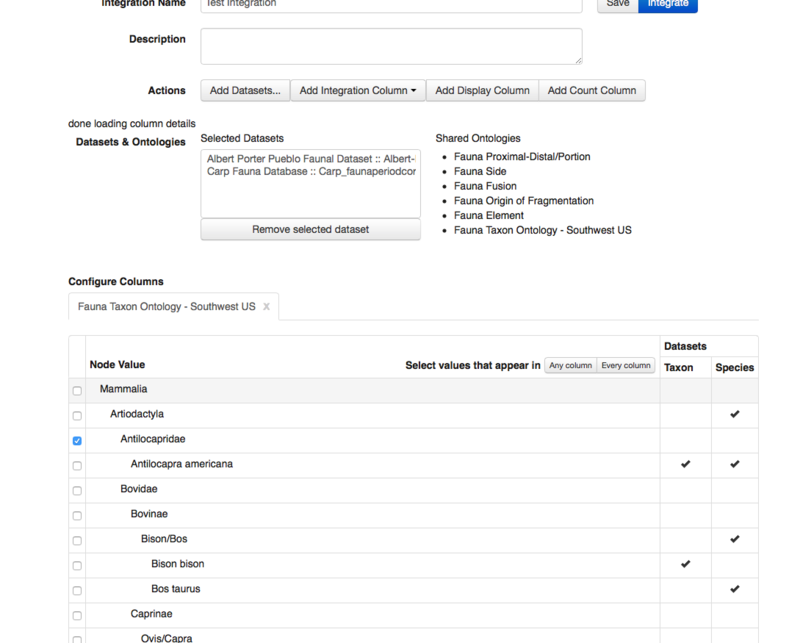 Those keywords and relationships are exposed as JSON-LD and embedded in each tDAR page. We’ve updated tDAR’s API documentation to include more info on what APIs are available, and how to access and/or use them. We’d love your feedback on their functionality and are more than happy to assist with any questions you have. We are always open to suggestions on what you think would assist in the continuous improvement of tDAR. Along with our existing search endpoints (HTML, and RSS / GeoRSS), we’ve added a GeoJSON endpoint for tDAR allowing easier display of tDAR results on ESRI, Google, and Leaflet maps. We hope you enjoy the new features and improvements available in our Obsidian release. As always, we encourage you to be in touch with questions or feedback. If you would like to learn more about tDAR for your personal or professional research and data management needs contact us. Digital Antiquity is pleased to announce the 14th major release of tDAR named Neolithic. This release focuses on three major areas of the repository: (1) visualization, (2) maps and spatial data, and (3) modularization and infrastructure work. In addition, the development team has improved performance and reliability as well as making a series of smaller enhancements. We have redesigned many of tDAR’s graphs and visualizations to be more interactive and appealing. Of note, in the world map which can now be explored and shows break-downs of the different resource-types by country. The graphs on the “explore” page have also be enhanced. Finally, the ontology browser has been updated to better display larger ontologies. 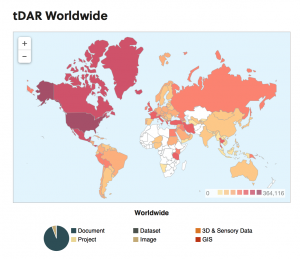 We’ve improved the underlying mapping libraries used in tDAR. 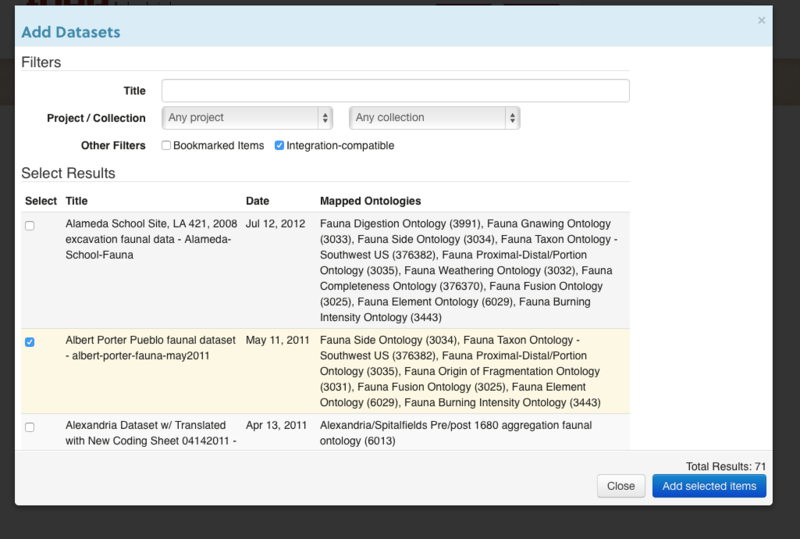 These enhancements allow us to cluster mapped search results, improving the interface. We’ve also updated the maps on the resource pages and improved the creation and management of bounding boxes on the resource edit screen. We’re proud to announce the latest release of tDAR (Munsell). This release was focused on modernizing and re-designing tDAR’s Data Integration tool to make it easier to use and faster, but also has a number of major feature updates across the application. For those unfamiliar with tDAR’s integration tool, it provides a means by which users who have uploaded data sets to tDAR can combine multiple data sets with different schema and coding conventions into a unified, shared data set. We’ve redesigned it to simplify the user-interface. Adding data sets is simpler. Users can search for data sets that are bookmarked or integrate-able (that is, having one column mapped to an ontology), as well as by keyword. 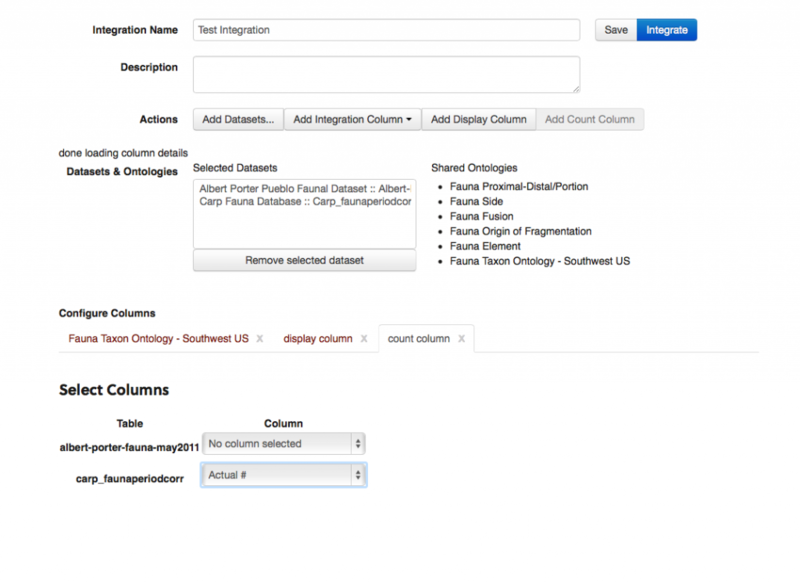 It is easier to add integration columns via a drop-down menu. 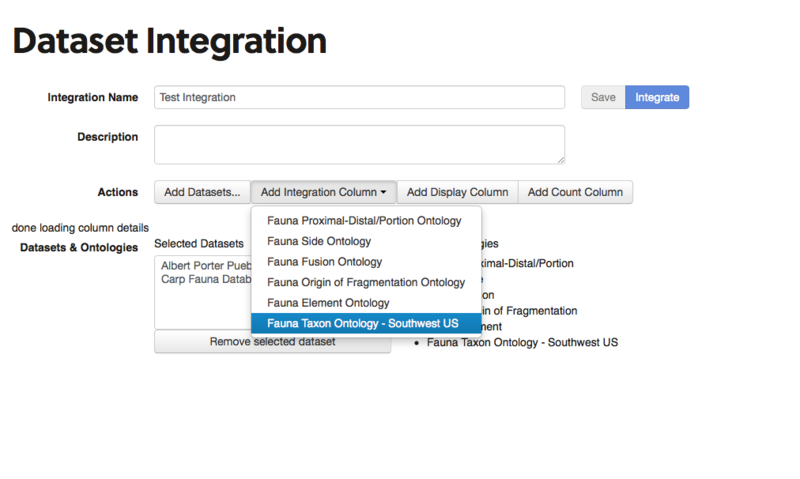 Once data sets have been added, if they share a mapping to an ontology, users can add an “Integration Column.” Integration columns allow users to further filter the resulting data set by selecting terms. 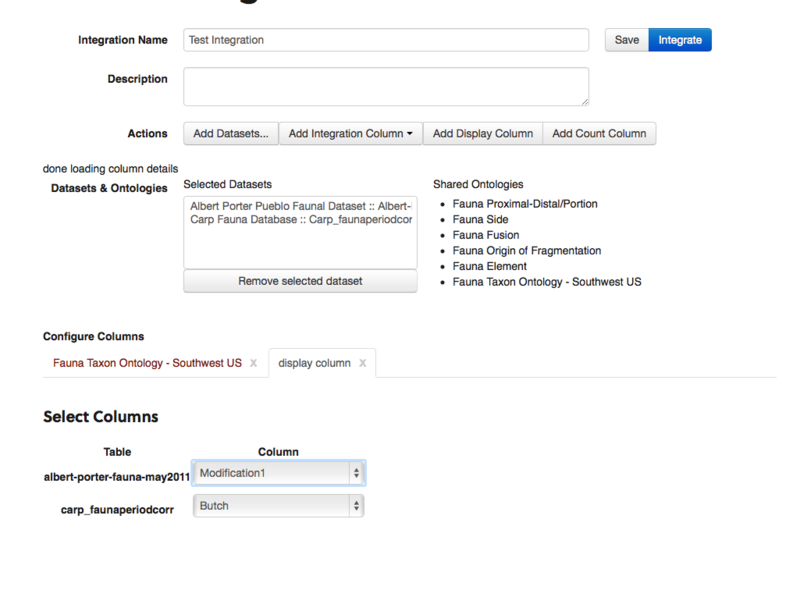 Once an integration column has been created, users can then “filter” results by selecting values from the ontology. tDAR display’s a checkmark where each data set has actual values. A new “count” column type that represents count data in data sets. A screenshot of a count column being added to an integration. It’s easier to add a display column. A display column being added to the integration. Each data set can supply one column to be included in a display column. We’ve added better documentation of the integration in the excel output. 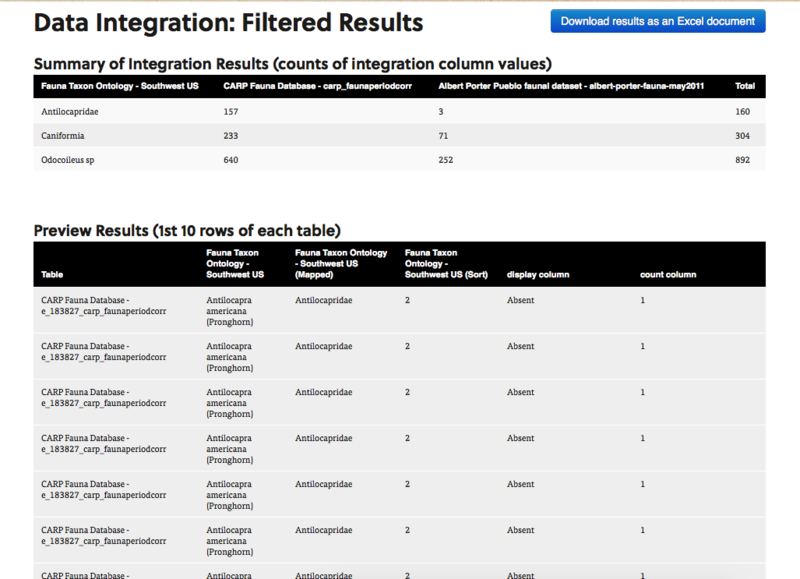 The Integration Results preview screen which includes a summary table, a preview of the results, and a link to download the full results. Integrations can now be saved and restored. 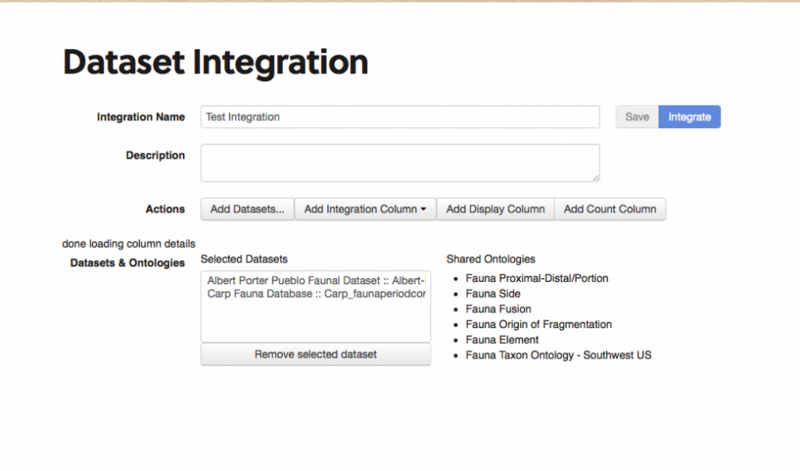 The results of integrations are now sorted by the selected integration columns. Embargoed files can now be restricted for different periods of time — 6 months, 1 year, two years, and five years. Institutions can now have email addresses and be used as contacts. The material keywords section now includes free-form material keywords as well as the existing controlled vocabulary. Contributors now have access to their view and download statistics for the resources, billing accounts, and collections they own or have administrative rights to. These statistics show the number of views and downloads for resources over time. Dedicated web pages have been introduced for keywords for improved browsing. Updated “user profile” pages in tDAR. tDAR’s OAI-PMH endpoint now supports “sets” which represent each of tDAR’s user-generated collections. The tDAR Import APIs now support replacing files and setting the same access restrictions on files as other materials. A number of backend changes to improve long-term sustainability. Digital Antiquity is proud to announce the release of “Knap,” the latest release of tDAR. The “Knap” release required the tDAR staff to take a step back and review the entire application from a number of major perspectives including, performance, security, data storage, and user-experience. Much of this work helps to establish features that will be available in future releases for you to enjoy. Improved validation and error messages for bulk uploads.